If you love the rustic or industrial look and want to carry it through to the bathroom, you don't have to use those standard bathroom vanity fixtures you find in the home improvement store or common lighting store, there are lots of options especially online. I have found a few vanity lighting options that work well with the industrial or rustic look you are going for. Make sure to get the right bulbs for these fixtures and you will have an authentic looking conversation piece that matches your colors and begs to be talked about! Light fixtures are just as important as the rest of the room. Don't redo your bathroom and forget about adding some pizzazz and originality with the right fixture especially over the vanity. This will definitely carry on the rustic warehouse theme with the wire cages. Use the Edison bulb and it will look awesome in your bathroom. You can't help but notice this fixture even when the lights are not on. It is a decorative as well as useful piece. With this style you get the larger bronze colored metal shades that hide the bulb, but give the feeling of those larger barn or warehouse light fixtures. This fixture is elegant yet rustic with the satin nickle finish and the wire cages around the lower shade add the rustic or industrial feel. 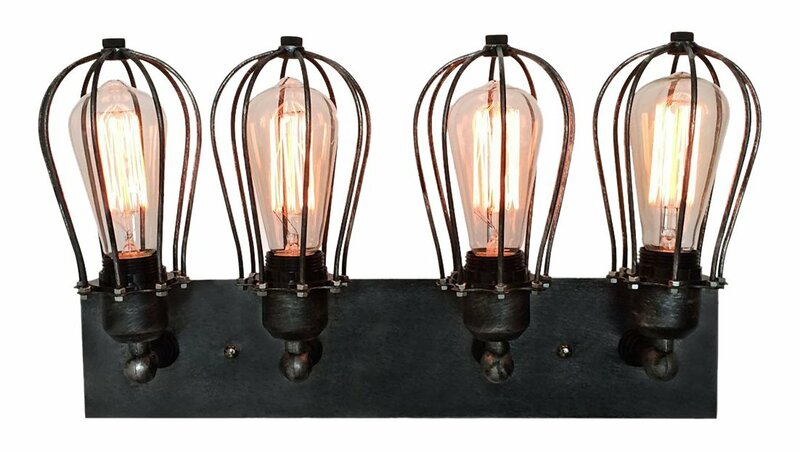 This fixture will really pop in your bathroom with the very authentic looking iron cages, black base and Edison bulbs. It is almost like having an art piece in your bathroom, as this type of fixture will still add to the decor and feel of the room. This fixture uses distressed wood as part of the theme, and the bolted on lamp shades really give a rustic warehouse look. This vanity fixture can either be installed with the shades up as pictured, or facing downwards and can be dimmed. The bulbs are included and it just has an awesome distressed feel with the seedy glass shades. This industrial vanity light fixture was handmade in the USA with authentic wire cages and wood base. Use the Edison bulbs and it will really have that realistic look you want with good lighting. Hand forged recycled steel is used in this fixture for a realistic old world look, yet safely wired for today's standards. You could have a few of these in a bathroom to really give the room some ambiance. The Edison bulbs add to the look. Check them out below. These Edison style bulbs may look old but they are ultra modern and safe and give off a really warm glow. They make the rustic industrial or warehouse light fixture come to life and keep the fixture looking older yet give off beautiful warm lighting. You don't want to spend the money on the rustic look only to have the totally wrong bulbs. You can get these online too. Bathroom vanities need to give off great lighting, but they also need to look good. Many people tend to skip investing in the right light fixtures for the room because of expense or think of them as something you need to hide. Make Light Fixtures Stand Out - Front and Center! Instead of trying to hide them or make them blend, make them front and center! Get something that makes you smile every time you go in that room, especially the bathroom. You don't want to have the right walls and floors in a rustic industrial styling only to have builder style cheap fixtures on the walls as something you just have to put up with! They may not be a large item, nothing compared to large pieces of furniture or vanities, but they can add tremendously to the feel of the room. Yes they may cost a little more than the run of the mill hardware store fixture, but they can have such a huge impact they should be included in your budget. Consider them the icing on the cake. Vanity lighting is noticed when you enter the bathroom whether it is switched on or not, it is a piece of art on the wall. So if you think you had to spend a lot of money to get your industrial bathroom vanity lighting, check out the ones above on this page, many are under 100 dollars! Also check out my other pages!